Citizens hold protests after President Maduro and his council suppress their right to a referendum on his presidency. 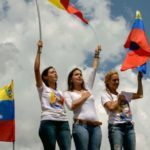 The wives of two jailed opposition leaders headed the marchers who were dressed in white and waved national flags. There’s no obstacle that can defeat Venezuelan mothers, fighting for the future of their children.